DEAL: Naturediet Bulk Order deal, 16 cases at £12.75 a case!! 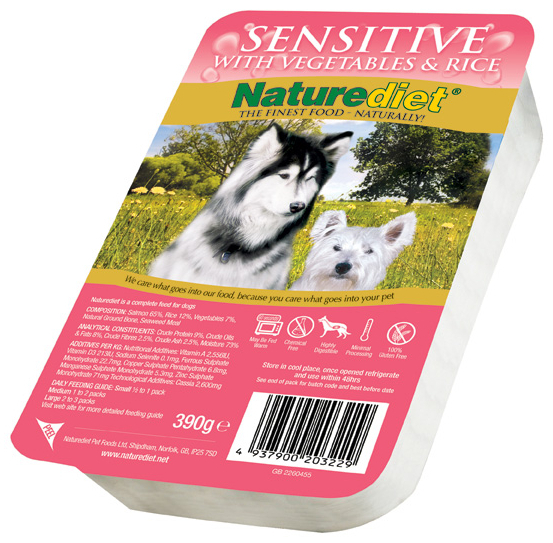 Naturediet is a complete natural dog food based on strict holistic principles. We believe in keeping dogs naturally healthy, that's why our wet dog food is hypo-allergenic and free from artificial ingredients, preservatives and other nasty chemicals; perfect for fussy eaters or dogs with allergies. We pride ourselves on the quality of our ingredients. 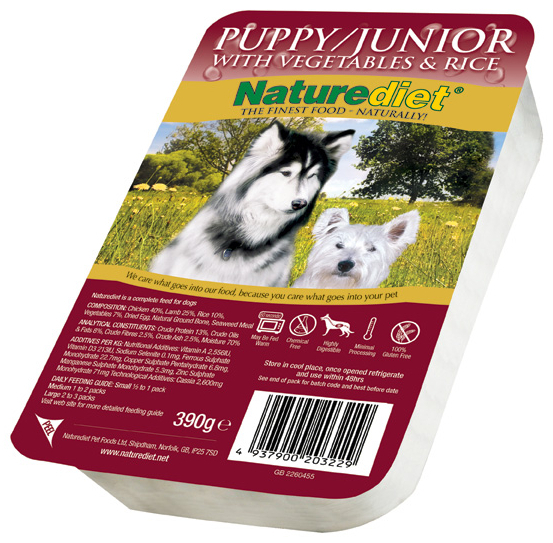 All our packs contain 65 per cent meat, rice, vegetables and other natural goodness, a fact that we think makes our menus the best wet dog food available for naturally healthy feeding. 39% Chicken, 26% Lamb, 10% Rice, 7% Vegetables, Natural Ground Bone and Seaweed Meal, Vitamins & Minerals. Young puppies have very small stomachs so divide their total amount of food into at least four small meals a day. By six months, twice daily feeding is sufficient. Chicken and Lamb min 60%, Brown Rice min 5%, Vegetables min 5%, Natural Ground Bone, Kelp, Herbs (Rosemary & Rubbed Sage), Omega 3 & 6 (provided by Flax, Fish Oil & Meat) min .25% & .75%, Vitamins and Minerals. Turkey min 40%, Rabbit min 20%, Brown Rice min 5%, Vegetables min 5%, Natural Ground Bone, Kelp, Herbs (Rosemary & Rubbed Sage), Omega 3 & 6 (provided by Flax, Fish Oil & Meat) min .25% & .75%, Vitamins and Minerals. Rabbit & Turkey min 60%, Brown Rice min 5%, Vegetables min 5%, Natural Ground Bone, Kelp, Herbs(Rosemary & Rubbed Sage), Omega 3 & 6(provided by Flax, Fish Oil & Meat) min .25% & .75%, Vitamins and Minerals, Vit A 1250iu/Kg, Vitamin D3 150iu/Kg, Vitamin e 20 mg/Kg. Protein 8%, Oil 7%, Fibre 1.5%, Ash 2%, Moisture 75%. There are currently no questions for Naturediet Breeder Pack - be the first to ask one!